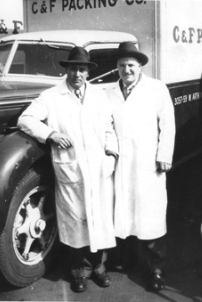 Sam Freda (right), principal founder of C & F Packing Company, came to the United States from Italy at the age of nine in 1920. He began his career in the meat business in 1931. Later, from a converted garage on Chicago’s West Side, C & F Packing was born and began serving the Chicago area with high quality meats. Since these early beginnings, C & F Packing Company has grown into one of the largest independent producers in the country of custom private label sausage products, meat toppings and fillings. In 1986, the company built and moved to its first state-of-the-art facility to specialize in cooked pizza toppings. C & F has continued to grow with the construction of a new 120,000 square-foot plant that was completed in 2001. This revolutionary plant is part of the next generation of food facilities that completely separates raw product operations from cooked product operations. This ensures the safety and quality of our products. The new building incorporates an innovative refrigeration and ventilation system that dedicates separate rate of supply and return air systems to both raw and cooked operations. Employees who handle raw product are separated from those who handle cooked product, with separate washroom facilities, break-rooms and amenity areas. A sanitary walk-on ceiling separates processing and maintenance operations by creating space above all the production areas. In addition, the ceiling also addresses a major area for bacteria growth by eliminating vertical pipe runs. At the heart of our operation is a computerized grinding and processing system that ensures consistent high quality products every batch. C & F’s facility also includes a pilot kitchen that is open to our customers on a reserved basis for use in conjunction with our Product Development and Quality Assurance departments. This means that our customers are able to work with us to develop signature items or to experiment on a new concept. C & F has incorporated low emission natural gas engines into the facility to produce the electricity requirements for operations. This provides a consistent and clean supply of electrical power and assures that no power outages will affect the product quality and flow. As we approach the future, C & F plans to continue growing by staying true to a simple principle that has served us well over the years.